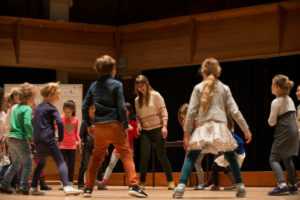 Muziek als Vak is a one-year (spread over 8 Saturdays and 2 weekends) teacher training course for musicians, music teachers and primary school teachers. Next to this certification course, the Royal Conservatoire offers an accredited two-year MA programme: the Master of Music According to the Kodály Concept. In addition to the programmes described above, twice per year, easily accessible masterclass weekends will be organised with international guest teachers. László Nemes from the Kodály Institute in Hungary and Lucinda Geoghegan from the National Youth Choir of Scotland are returning guest teachers. Participants can also take part in study tours to Kecskemét, Budapest and Glasgow. The Kodály Philosophy, also often referred to as the Kodály Concept or Kodály Method, is an approach to music education developed in Hungary during the mid-twentieth century. Composer, music educator and ethnomusicologist Zoltán Kodály’s views on music education served as a great inspiration for the educational method, which was developed over a number of years by his associates. Kodály (1882-1967) became interested in music education in 1925 when he overheard his students singing songs that they had learned in school. Appalled by the standard of the repertoire and the way of singing, Kodály was inspired to take action in order to improve the music education system in Hungary. He wrote articles, columns, and essays to raise awareness about the issue of music education in schools. In his writings, he criticised schools for using poor-quality music and for only teaching music in secondary grade. Kodály insisted that the music education system needed better teachers, a better curriculum, and more class time devoted specifically to music, all based on the thought that children deserve the best possible quality of music education. Kodály’s educational philosophy is based on learning music primarily through singing. Teachers need good musicianship and singing skills. Folk songs and singing games, as well as composed music, are part of every day’s musical activities. Relative solmisation, hand signs and rhythm names are being used to help the process of acquiring musical literacy, making music learning a joyful and valuable experience. Want to know more about our education?